As part of the Coach Edition Team at TrainingPeaks, I have the opportunity to work with a wide range of coaches. I have helped coaches who have been doing it for years, those who have just started coaching, and even those who are still considering the idea of coaching. These coaches also vary from the part-time coaches with ‘just a few athletes’ to the full-time coaches who make it their livelihood. The common theme between these coaches has always been the business side of coaching. Whether coaching for fun, as a side income or coaching full-time, there is always a strong consideration in investing money into the business. When starting a business, or trying to grow one, every dollar spent you expect to see a return on. Here are some of the most common investments and how I have seen them work for coaching businesses. Here at TrainingPeaks, we develop the Coach Edition product with you in mind. We want a place that takes care of nearly all of your needs- from planning, track, and analyzing communication and organization. When I work with coaches they have already shown an interest in using TrainingPeaks. Coaches understand there is an investment in opening and maintaining an account with us. Wanting to make sure you are getting the most for that money is not only understandable but expected. A coach account can save you hours of time planning for athletes with the workout library and features like training plans, copy and paste, and group calendars. It is easy to organize your athletes into groups to help you decide quickly on who to focus on. Search your saved workouts and sessions to quickly drag and drop the correct workout onto an athlete’s or group’s calendar. Athletes can view workouts on the web, mobile, and email to know exactly what they should do for the day. Once these athlete’s complete a workout, their files upload easily to TrainingPeaks for you to review and analyze. Using Post-Workout Notifications and/or in-app notifications can help you decide quickly if you need to look over a file or leave it for another time. Notes can be left by athletes so you can match how an athlete perceived the effort during a workout or race and compare that with the data you are reviewing. You can then respond or leave a note for the athlete to highlight things that went well and things to focus on for the next time. For those coaches who have come from using another way of coaching, we see about a two-fold increase in the number of athletes they can work with in the same amount of time when they switch to TrainingPeaks. Every day, thousands of athletes visit TrainingPeaks.com looking for expert instruction to help them reach their goals. To make it easier for these athletes to find expert coaches like you, we created the new and improved Coach Search and Coach Profile. Your Coach Profile makes you discoverable by athletes searching for your services. Let athletes know about your business, your qualifications, and expertise. Athletes can also contact you directly from your profile. Gain more clients and grow your business using your Coach Profile. Increased work efficiency saves you time and allows you to work with more clients. TrainingPeaks University is designed to help coaches effectively use all aspects of TrainingPeaks. A two-day class, TPU covers topics from onboarding clients, key features, best practices for your workflow, and offers tips on growing your business. Set in a small classroom format for optimal communication, it provides the opportunity to learn from new to experienced coaches, network with your peers, and earn CEU’s. Gaining clients is one of the biggest challenges facing all coaches. After meeting the requirements to join, the Coach Match Service matches you directly with athletes looking for your services. After receiving an athlete submission, we hand select from the Coach Match Service the right coach for that athlete. We offer two levels of the Coach Match Service and both will help you grow your business. WKO4 is a robust analysis tool that allows coaches to perform the most detailed data analysis. If you are ready to take your coaching to the next level and further separate yourself from the competition, using WKO 4 can be that platform. Your increased ability to analyze files will quickly provide you with the knowledge to hone in on specifics for those athletes who are looking for that extra edge. Mentioning your use of WKO4 with certain coaching packages can encourage athletes to upgrade to a high level of coaching and give your business an extra professional look. Having your athletes achieve their goals is the best way to keep athlete retention high. Best Bike Split can help you and your athlete develop the perfect race strategy to make sure this happens. BBS allows you to create the perfect race day strategy, find the fastest setup, model different power outputs and drag numbers, and more. BBS is the best way to ensure your athletes make the most of their hard earned fitness. Collecting payment from your athletes can be a time-consuming process. One that takes away time from your actual coaching and is a headache for many coaches at the beginning of every month. Setting up an invoicing system that can send and track payments can help decrease the time spent. Things like Quickbooks will cost upfront but can save you money with tracking tools and invoicing tools so you don’t miss a payment from an athlete or forget to send out invoices to someone. Deciding upfront how you are going to invoice and what type of payments you are going to take will eliminate guesswork and policy changes in the future. Having this setup and the expectation set for athletes will encourage prompt payments in the way you would like to receive them. Creating a great looking website has become much easier recently with companies like Squarespace. A website will give you the ability to promote your business, post content, connect with your athletes, and help new athletes find you. Linking websites and social media can be a great way to grow your audience. Athletes love content and a website will give you the ability to add your voice to the content already out there. Advertising your business can take many different forms. The key is to know what your goals are first. Are you trying to gain more clients? Are you trying to sell training plans? Are you trying to build your business and have multiple coaches under you? Advertising can help tremendously with achieving success in those areas. This could come from paid advertisements locally or on social media. It can also be achieved by having a presence in your local race scene. Showing up and setting up a tent or booth to talk with athletes and handing out your information can go along way in integrating your business in community you are trying to reach. Having business cards on hand always is a great habit and makes you prepared for any connection you make throughout your day. Certifications can set you apart from the competition. They show you have spent extra time, effort and money to further your knowledge and become the best coach you can be. These certifications can range from a National Governing Body certification to a TrainingPeaks accreditation. You can also consider a specialization in nutrition, bike fitting, or other niche areas. While continuing education is often a re-certification requirement, it can also be based on your interest in learning more about the most recent science and studies, furthering your knowledge base. Staying up to date with the latest in science and best practices will help keep athletes engaged. In turn, this creates a very strong bond and trust between you and your athletes, which can significantly decrease athlete turnover and can increase your word of mouth advertising by those athletes. Conferences like the Endurance Coaching Summit are a great place to learn but also serve as a great place to network and meet like-minded coaches. You can discuss ideas from coaching philosophies to business ideas and best practices. The environment sends you home excited to try new things and tackles problems you have encountered. Your athletes are already a living advertisement for your business and outfitting them with a kit, T-shirt or hat can get your logo out to more races or group training then you are able to show up to. Including a website and contact info on the merchandise will make it easy for others to find you and your business. If you are showing up to a lot of races, a pop-up tent with your business’s logo can provide great exposure and encourage interaction. Allow athletes to hang out, warm-up and cool-down in the shade of your tent. While they are there you have the opportunity to interact and hand out your business card. If you design a great looking kit, not only will it serve as a great advertisement, but you can have a potential income generator there. Offer your kits for sale on your website and social media. Offer discounts to your athletes to get the kit out in the open. One of the best advertisements can be a local athlete doing well in races. If that athlete is well liked and respected in the community their opinions are valued by others. Coaching this athlete for free or a discount can be one of your best lead generators. When others see someone they respect doing well your coaching will be a big topic of discussion and the interest in your business will skyrocket. Have this athlete help by talking about your coaching and handing your business card out. Another sponsorship opportunity is connecting with a local club or team. 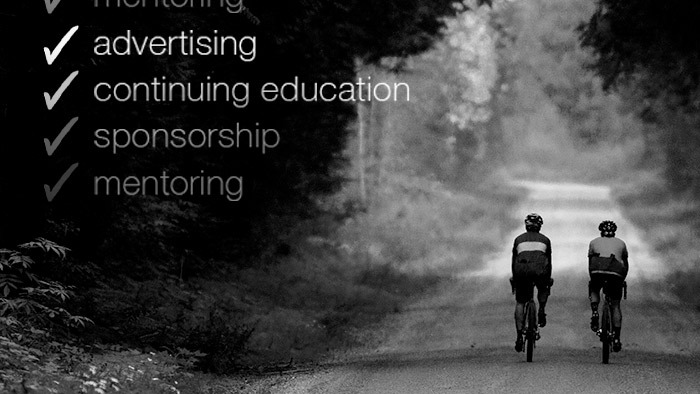 You can help with coaching, doing clinics, or just organizing rides. Offering a discount on coaching for the club can help you gain a lot of athletes at once. In exchange, you could ask to have space on the club or team’s kit. Training plans themselves can act as a great lead generator for your business. Catering a few plans for a local race and providing those at a discount or free to the participants can help spread your name and grow your business. Partnering with the promoter of these races is a great idea. You can have the possibility to be on the race’s communications along with your own. Don’t forget to show up to these races to talk with the athletes in person. One of the best ways to learn the coaching trade is from an experienced coach. There are many who offer mentoring programs for a price and the investment will last a lifetime. You can search for coaches online or ask around your local area to see if someone is willing to help.